The Anatinae are a subfamily of the family Anatidae (swans, geese and ducks). Its surviving members are the dabbling ducks, which feed mainly at the surface rather than by diving. The other members of the Anatinae are the extinct moa-nalo, a young but highly apomorphic lineage derived from the dabbling ducks. There has been much debate about the dabbling ducks' systematical status and which ducks belong to the Anatinae. As understood here, the subfamily contains only the dabbling ducks and their close relatives, the extinct moa-nalos. Alternatively, the Anatinae are considered to include most "ducks", and the dabbling ducks form a tribe Anatini within these. The classification as presented here more appropriately reflects the remaining uncertainty about the interrelationships of the major lineages of Anatidae (waterfowl). The dabbling duck group, of worldwide distribution, was delimited in a 1986 study to include eight genera and some 50–60 living species. However, Salvadori's teal is almost certainly closely related to the pink-eared duck, and other genera are likewise of unresolved affiliation. The peculiar marbled duck, formerly tentatively assigned to the dabbling ducks, is thought to be a diving duck or even a distinct subfamily. This group of ducks has been so named because its members feed mainly on vegetable matter by upending on the water surface, or grazing, and only rarely diving. These are mostly gregarious ducks of freshwater or estuaries. These birds are strong fliers and northern species are highly migratory. Compared to other types of duck, their legs are placed more towards the centre of their bodies. They walk well on land, and some species feed terrestrially. "Puddle ducks", as they are also called, generally feed on the surface of the water or feed on very shallow bottoms. They are not equipped to dive down several feet like their diving counterparts. The most prominent difference between puddle ducks and divers are the size of the feet. A puddle duck's feet are generally smaller because they do not need the extra propulsion to dive for their forage. Another distinguishing characteristic of puddle ducks when compared to diving ducks is the way in which they take flight when spooked or are on the move. Puddle ducks spring straight up from the water, but diving ducks need to gain momentum to take off, so they must run across the water a short distance to gain flight. Traditionally, most ducks were assigned to either the shelducks, the perching ducks, and the dabbling and diving ducks; the latter two were presumed to make up the Anatinae. However, the perching ducks turned out to be a paraphyletic assemblage of various tropical waterfowl that happened to evolve the ability to perch well in their forested habitat. 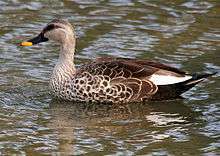 Several of these, such as the Brazilian teal, were subsequently assigned to the Anatinae. As for the diving ducks, mtDNA cytochrome b and NADH dehydrogenase subunit 2 sequence data indicates that they are fairly distant from the dabbling ducks. The morphological similarities are due to convergent evolution. In addition, the genus Anas, as traditionally defined, is not monophyletic; several South American species belong to a distinct clade which would include the Tachyeres steamer-ducks. Other species, such as the Baikal teal, should also be considered distinct. 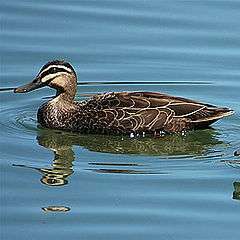 Knob-billed duck (Sarkidiornis melanotos melanotos): a misplaced dabbling duck? Subfossil remains of a small, flightless dabbling duck have been recovered on Rota in the Mariana Islands. These cannot be assigned to a known genus, but probably are closest to Anas. A most bizarre ducklike bird, Talpanas lippa has been found on the Hawaiian island of Kauai. Because of its unique apomorphies (it seems to have had small eyes high and far back on its head), the placement of this anatid is likewise unresolved; only dabbling ducks and true geese are with certainty known to have colonized the Hawaiian chain. Another bizarre insular anatine was Bambolinetta from the Late Miocene of Tuscana, then part of the Tuscano-Sardinian insular landmass. Flightless or at least a poor flyer, it instead shows adaptations for wing-propelled diving, occupying a similar ecological niche to that of penguins and plotopterids. Nettapus – part of ancient Gondwanan lineage? 1 2 3 4 5 Johnson, Kevin P.; Sorenson, Michael D. (1999). "Phylogeny and biogeography of dabbling ducks (genus Anas): a comparison of molecular and morphological evidence" (PDF). Auk. 116 (3): 792–805. doi:10.2307/4089339. ↑ Sraml, M.; Christidis, L.; Easteal, S.; Horn, P.; Collet, C. (1996). "Molecular Relationships Within Australasian Waterfowl (Anseriformes)". Australian Journal of Zoology. 44 (1): 47–58. doi:10.1071/ZO9960047. ↑ Steadman, David William (1999). "The Prehistory of Vertebrates, Especially Birds, on Tinian, Aguiguan, and Rota, Northern Mariana Islands" (PDF). Micronesica. 31 (2): 319–345. ↑ Burney, David A.; James, Helen F.; Burney, Lida Pigott; Olson, Storrs L.; Kikuchi, William; Wagner, Warren L.; Burney, Mara; McCloskey, Deirdre; Kikuchi, Delores; Grady, Frederick V.; Gage, Reginald II; Nishek, Robert (2001). "Fossil Evidence for a Diverse Biota from Kauaʻi and Its Transformation since Human Arrival". Ecological Monographs. 71 (4): 615–641. doi:10.2307/3100038. hdl:10088/109.